Measure from the bottom of your drapery rings to the floor, referring to the measuring diagram on this page. If using rings with clips for installation, measure from clip to the floor. 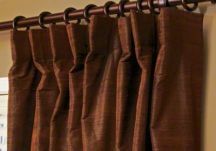 Custom flat drapes provide a simple and uncomplicated look and will work on most poles with rings. With the flat top style, the top of the drapery is hemmed with a light stiffening fabric. The drapery panels attach to drapery rings with hook pins, which are already set in the panels. Because of the interval spacing of the hook pins, this allows the drapery to softly cup between the rings.